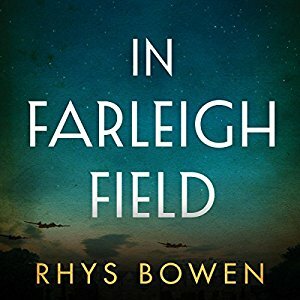 I've read several of Bowen's Her Royal Spyness books, and found them silly and superficial enough that it made me reluctant to try In Farleigh Field. The description and the sample moved me to try it anyway, and I'm glad I did. With World War Two starting, the five daughters of Lord Westerham are all faced with their separate challenges. The eldest, Livy, is married and has a baby, and her husband has been sent off to the Bahamas, as part of the "security" for the Duke of Windsor. Lady Margaret is in France, trapped there when she chose not to leave her French lover as the Germans advanced. As he's part of the French resistance, she's in real danger. It's the third daughter, Lady Pamela, who is most central to the story. She's been more or less in love with neighbor Jeremy Prescott, bad boy & RAF flyer. Unfortunately, he's now been shot down and captured by the Germans. Neighbor and local vicar's son Ben Cresswell was injured in a flying accident--with Jeremy as the pilot--just prior to the war, and is now doing a dull, government office job in London, as is Pamela. What neither their families nor any of their friends know is that Ben is an MI5 agent, and Pamela is a Bletchley Park code breaker. What Pamela doesn't know is that Ben is in love with her. Meanwhile, back at the Sutton family home, Farleigh, a parachutist whose chute never opened has fallen and died in a nearby field. He's wearing a British uniform, but it's not quite right, and he doesn't have identification. Margaret, known as Margo, is arrested by the Gestapo. Jeremy returns to Britain, with a heartwarming story of escaping from the Germans. Pamela and Ben have each been giving mysteries to solve. Youngest daughter, Lady Phoebe, befriends the young London evacuee, Alfie, with whom she found the dead parachutist. There's a plot afoot, related to the planned German invasion, and no one is safe and no one knows where the danger is coming from. This is rich, well plotted, tightly paced, with interesting, well-developed characters.